DML’s affiliate cyber-hobby.com continues repackaging and re-releasing older kits in useful sets with new parts to entice the modeler. In this case, the old JS-1 and JS-2 (DML kits No. 6052 and No. 6012, which were actually IS-85 and IS-122 according to Soviet lore) have had their unique parts bundled into one kit with an older set of figures(No. 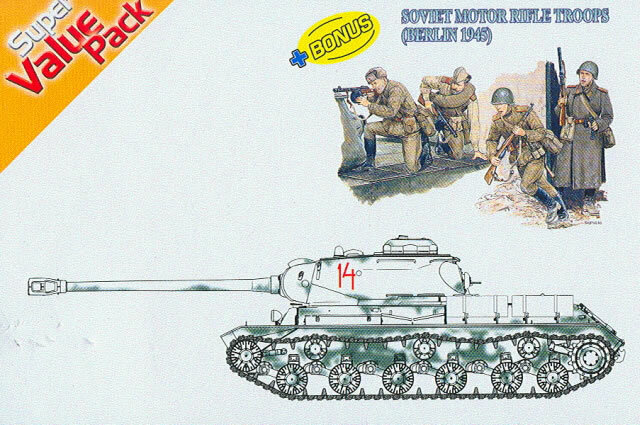 6019, Soviet Motorized Rifle Troops in Berlin 1945) and a nice new set of modified IS tracks (“split track” and not “cut tooth”) included from the popular “Magic Track”. It is likely that some modelers may wish to purchase the kit just for the latter, as they are outstanding and on their own nearly rated this kit a “Highly Recommended”. Note that the “split tracks” come in one piece and are not set up for use Soviet-style as extended tracks – the idea was to fit a regular link and a split link together to give an extended track link every other track for use in snow, mud or marshy ground. While more common on the ISU-122 and ISU-152 vehicles, they have been seen on IS-2 series tanks. The kit also includes both the 122mm D-25T gun for the IS-2 and the 85mm D-5T fitted to the original IS-85 (later IS-1) series tanks. The hull appears to be the so-called “soft nose” early hull which was actually cast for the stillborn KV-13 medium tank project. The hull also comes with standard 90 liter auxiliary fuel tanks and not the 160 liter ones also seen on early IS tanks; this isn’t wrong, it’s just that DML should have given the modeler the option. However, the kits are as offered initially nearly 15 years ago and have not been corrected or updated. The road wheels are still only 14.3mm (15.3mm is correct for 535mm diameter wheels) and the lower hull is the original one which has been the subject of debate on the internet. I have seen figures of it being 1.3 to 2.3 mm too low, even thought from the Russian plans I have and the one I measured at Duxford it seems to be correct. There are also some fine shape problems to the turret and the overly coarse simulated casting finish to the parts, but for the most part it still has to be said that the kit LOOKS like an early IS series tank. Finishing directions are included for two IS-2 and one IS-1 heavy tanks: Unidentified unit, Vitebsk, 1944 (IS-2 - whitewash with red “14"); 4th Guards Tank Army, Eastern Front 1944 (IS-2 three-color camo upper hull, white 222); 1st Guards Tank Heavy Breakthrough Regiment, 11th Guards Tank Corps, Ukraine 1944 (IS-1 - whitewash with no markings). The figures were one of the better early DML sets and look the part of Soviet infantry from the 1945 period. (DML should be aware that at that time most of the infantry were either straight infantry or mechanized infantry as the term “motorized rifle did not come into full force until long after WWII.) These were one of the first of the Ron Volstad sets and the original full color artwork for finishing them is included. As they are “Gen1" figures the weapons are not state of the art but are scale and a good result may be achieved. Overall, this is a nice combo for a reasonable price and unless one is a real stickler will built up to look the part of an IS tank on the offensive with supporting infantry. 6019 43 Four figures and basic kitThanks to Miin Herng Tsueng for the review sample.